When you need to make curved cuts, particularly on plywood, particle board, or other relatively thin materials, few power tools are as handy as a jigsaw. Among fine woodworkers, jigsaws are sometimes maligned for the propensity of the blades to bend and ruin straight cuts, but these risks are manageable for most DIYers and casual crafters. 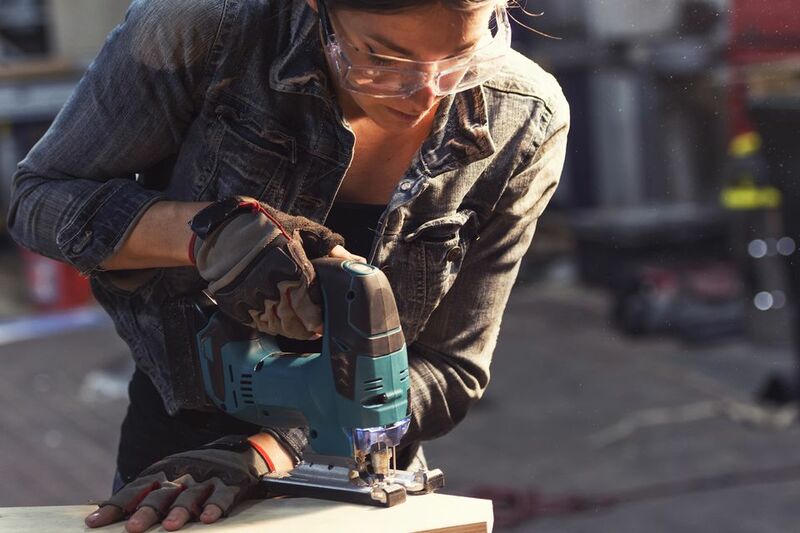 The possibility of an angled cut should not prevent you from adding one of these versatile, portable power tools to your collection. A good jigsaw with the proper features will be a workhorse in your workshop. Expensive, good jigsaws feature two main features that account for their added cost: orbital action and variable speed. A number of other features are less critical, but may be important for you. A standard action jigsaw moves the jigsaw blade solely in an up-and-down motion, while in an orbital-action jigsaw the blade moves slightly forward and into the workpiece on the upswing, then slightly backward on the downstroke as the blade resets for the next cutting stroke. The movement the blade is slightly elliptical, which minimizes the wear on the blade and eliminates the chattering action that sometimes occurs with cheaper saws. The angle of the action can typically be adjusted for different types of materials. The cuts on an orbital-action jigsaw is almost always smoother than with standard-action saws. Second, higher-end jigsaws will feature variable speeds. While this isn't always necessary when woodworking, it is especially useful if the jigsaw is used to cut metals, where slower speeds make for better cutting. Slower speeds can also be helpful when making intricate curved cuts. Although it may not be used often, variable speed is a feature that is well worth the extra cost for most people. Like most tools, higher amperage ratings indicate jigsaws that have more cutting power. The best jigsaws will have motor ratings of 6.5 or 7 amps; bargain saws might be rated for 5 amps or less. Most jigsaws will cut up to 2 inches of depth in woodworking applications, and approximately 1/2 inch on metal. Some jigsaws may feature a slightly deeper cut, but this isn't necessarily desirable on a jigsaw, as the deeper the action, the better the chance of the blade bending and breaking. Because jigsaws blades have a tendency to bend, particularly on thicker stock, a deep cutting depth is more likely to create an undesirable angled cut. To combat this, avoid cutting directly up to your cut line. Instead, leave a bit of material next to the line (1/8 inch is acceptable), and then use an oscillating drum sander to finish down to the line. Most manufacturers now offer cordless jigsaws. Although historically these tools are not nearly as powerful as their corded counterparts, recent improvements in battery technology have reduced the gap. However, if you are buying a single jigsaw, a corded model is still the better choice, as it will handle all stock and all cutting duties with ease. If you are the type of craftsperson who owns multiple models of the same tool, then a cordless jigsaw makes a good second tool. Some types of jigsaws are marketed as scroll saws. They have a blade-steering knob on top of the tool's body, directly in line with the blade, that allows the blade to be rotated while cutting. In theory, this feature should make it easier to cut tight curves, but the problem with these saws is that pressure behind the blade must be kept consistent in order to control the cut, and this can be difficult when the knob is turned to a sharp angle. Many woodworkers find that scrolling capability really isn't necessary and may even be counter-productive in certain situations. Some jigsaws have a feature that blows a stream of air over the workpiece just ahead of the blade. This keeps the cutting line free of sawdust and debris, making it easier to follow the cutting line. This is a mildly helpful feature, but not one that is essential. In the best saws, the stream of air can be adjusted. Older saws required the use of a hex wrench or other tool in order to mount or remove the blades. It is very convenient to have a lever-action blade change feature that requires no extra tool. Most jigsaws have adjustable shoes that allow you to angle the tool for bevel cuts, but the best tools will have preset stops at the common angles, such as 22 1/2, 45, and 60 degrees. Avoid saws with stamped aluminum shoes; better tools have cast steel bases. A splinter control shoe, which is a small insert on the shoe of the jigsaw, helps keep splintering to a minimum. A trigger lock allows you to lock the jigsaw to a particular speed. A dust collection bag is found on some models. This feature may be worth looking for if you have sensitivities to wood dust. Some models can be connected to a shop vacuum for more complete dust management. There are also intangibles to consider. Handle shape and cushioning may spell the difference between a jigsaw you love to use and one that leaves you with a cramping hand after a few minutes of work. A tool marketed as being "low-vibration" may also offer a notable advantage for you. Of the various extra features that are available, variable speed may well be the most important, followed by orbital action. Beyond this, the choice of additional features is largely a matter of personal preference. Look for the features that are important to you and ignore the others.